Kolar Offers History And Adventure in Equal Measure to Its Travellers. If you wish to gain insight into the rich history of Karnataka and how it was ruled by several dynasties, visit the small town of Kolar about 80km away from Bangalore. It has been known for its famous gold mines, exquisite temples and fortresses that have enchanted travellers for a long time now. The epic city of Kolar is the doorway to Tirumala Temple, the abode of Lord Venkateswara and is located in the southern part of Karnataka. Kolar has many attractions like Someshwara Temple and Kolaramma Temple. The beautiful Someshwara temple is an interesting piece of architecture built during the Vijaynagara rule dedicated to Lord Shiva. Kolaramma temple, some distance from Someshwara temple, was built and dedicated to Goddess Shakti. These temples are historically rich and form a significant part of the Kolar culture. Someshwara Temple is famous for its large temple tower with nice carvings on the pillars and large mandapas. There is also a stepped temple tank adjacent to the temple where you can learn about the history associated with it. 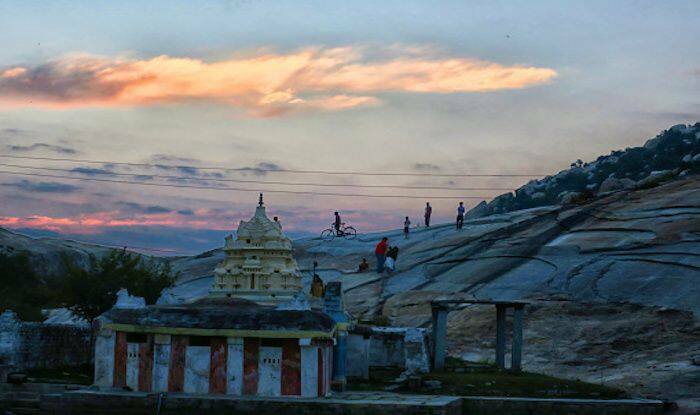 An interesting place near Kolar is Anthargange which is a popular hill and trekking spot among travellers leading to Sri Kashi Vishweshwara temple. It’s a unique mix of trekking and cave exploration that takes the excitement a notch higher. Anthargange hill is completely surrounded by boulders, located at altitude 1712m above sea level. Catching sunrise in Anthargange makes for an unforgettable experience. The trek is 3km in length; it starts with finding a way through rocks and a tricky pathway among the boulders to finally arrive at the cave site. The experience at Anthargange cave will take you back to prehistoric time, and you may end up feeling like a “Cave Man.” Unwind by the bonfire here after dusk, and all the efforts and will pay off. If you’re lucky, you might catch a glimpse of some wild animals around.